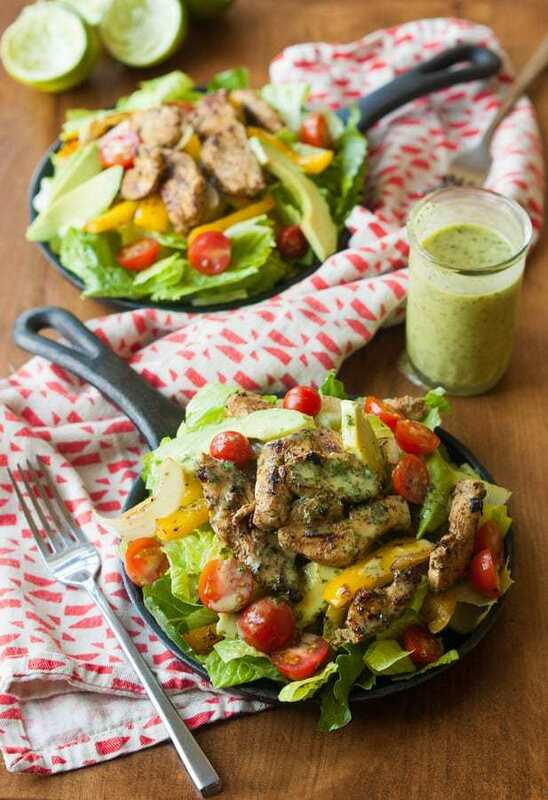 This takes a Paleo chicken fajita salad recipe to the next level. It is full of flavor and will keep you satisfied and content. One of my absolute favorite places to eat out used to be Cafe Rio! The food is so delicious! I used to find any reason to go to Cafe Rio to eat. This sizzling cilantro lime Paleo Chicken Fajita Salad is almost like eating chicken fajita’s but without the tortillas, so it’s gluten-free too and more healthy. For work lunch parties we almost always decide to go to Cafe Rio. Oh, my goodness – their Sweet Pork Barbacoa Salad is to die for! The combination of the pork and the house dressing so delicious. I can’t eat there now though. It’s definitely not Paleo. For example, they put Coke and brown sugar or something like that on their sweet pork. So I have been wanting a good recipe to make at home to satisfy my cravings for a good Cafe Rio style salad. This Paleo Chicken Fajita Salad definitely exceeded my expectations. It is a great recipe and I continue to make this recipe quite frequently. 🙂 I love the marinade for the chicken and veggies and I could drink the vinaigrette. I love how it’s so versatile – I also love to grill the chicken and veggies and eat them by themselves with just the dressing. 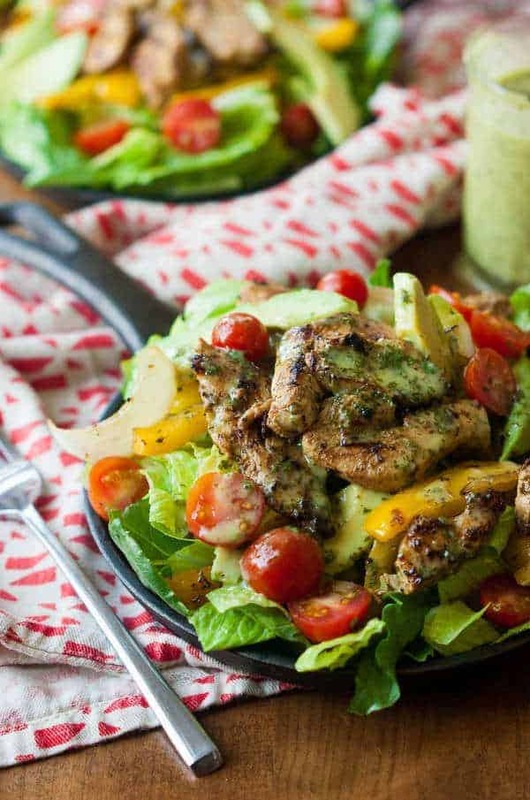 This takes a Paleo Chicken Fajita Salad recipe to the next level. It is full of flavor and will keep you satisfied and content. This is a great salad for a fajita flavor without the tortilla. It can be modified to fit your taste easily as well. This works well for a whole meal since it has so many parts to it. I also love to serve this at large family parties since people can pick and choose what they want and they can choose if they want to make a salad or a taco from the ingredients. The dressing is the highlight of the salad. It never ceases to amaze me how you can put a few ingredients in a blender and they come out a whole different thing than went in to the blender and it tastes so much better than if you just poured the ingredients for the vinaigrette right on the salad (don’t ask me how I know that . . .). What we end up doing a lot for family parties is we grill both chicken tenders and chicken thighs after we marinade the meat. While it’s grilling, we cook the veggies in the oven so we can cook lots at a time and not have to watch them so much. We just put them on a 9×13 pan or cookie sheet, drizzle with oil and sprinkle with salt. Then for serving, along with the salad ingredients, we put out different options so people can make what they want. We have tortillas, sour cream, cheese and black beans for tacos, burritos or normal fajitas. Everyone loves how they can make their own variation and kids don’t have to eat the parts they don’t like. You really can use any type of oil you want. I say to use avocado oil because that’s the main oil I use. It has a high smoke point and mild flavor and they sell it at Costco. I don’t recommend extra virgin olive oil because it’s hard to find one that’s truly olive oil that I can afford and because the flavor is too strong. You can also prepare the marinade and chicken and freeze it ahead of time. It makes it extra flavorful and extra juicy. Let me just say that just about anything with this vinaigrette is good. So good. Like, excuse me while I sneak out of the room for a minute and drink this. I grow tons of cilantro in my garden just so I can make this stuff because it can be expensive at the store. 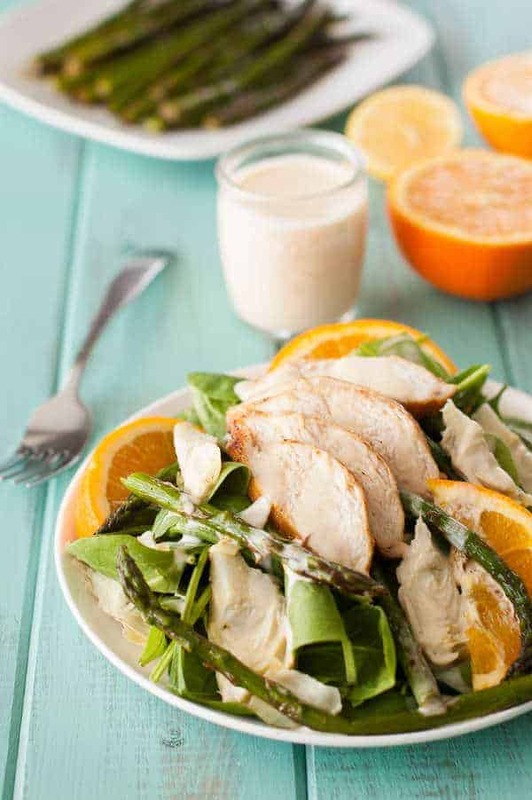 Give this clean eating chicken salad a try! I think you’ll be pleasantly surprised by how much vinaigrette you keep pouring on because you just need more and more. Do you eat salads more for lunch or dinner? Share below! Let marinate overnight or for several hours, if possible. You can also skip letting it marinade and use it immediately. It will still taste great! Prepare salad plates (or a large bowl) by placing lettuce, avocado sliced, and cherry tomatoes on each plate(or all together in a bowl. I tried this and it was delicious. Incredible dressing, doubled recipe for marinade and dressing for other uses. I almost thought marinade was going to make meat salty because of taste but it balanced out great. Thanks for recipe. Will be using leftover chicken for burritos and tacos. I’m so glad you like it! We make the meat all the time and sometimes use it on the salad and sometimes use it for tacos, fajitas, plain, in burritos – all sorts of things. It’s so multi-purpose and delish! OMG! This recipe was AMAZING!!! I’m so glad you like it. We love it too! Would you be able to substitute avocado oil for the light olive oil since your going for a milder taste? Definitely! We often use avocado oil instead of light olive oil in this recipe. So, so good! The flavors are amazing. This is definitely now in my top 5 favorite paleo receipes. Can’t wait to have leftovers. Thank you so much for such a delicious recipe! I’m glad you like it! It’s one of my favorites too. This salad is delicious! This is my second time making it. But just out of curiosity, I noticed in a previous comment you mentioned that myrecipemagic calculates this as about 319 a serving. When I input these ingredients into myfitness pal it comes out to almost double that. I’ve checked and rechecked serving sizes and cannot figure it out!! Do your calculations not include the marinade ? I have no idea how I could be so far off! Thanks ! Here’s the thing. I just checked on My Recipe Magic and the whole recipe is there. But I’ve had really bad luck with nutritional calculators and I can’t find a good one to put on my blog, because of such inconsistent results and because every person’s serving size varies so greatly. So I recommend you put the ingredients for how much you eat in to your own nutritional calculator and always use the same one so you’re comparing apples to apples. I’ve had that My Fitness Pal is a pretty good one. I made this recipe tonight for my family. It was delicious! It such a flavorful salad. I’ve never had a salad like it. Thank you for sharing this gem with us. I’m going to follow your blog for future treasures. I’m so glad you like it! Our family loves it too and I hope you find lots of other good recipes on my blog. Do you know if it keeps well if you freeze the marinated chicken/peppers? I am meal prepping and won’t be getting to the actual meal till a few days. I’m not one to meal prep or freeze, so I don’t know the answer, but maybe someone else does so I’ll leave the question on here for others. I have made lots of freezer meals this way – marinade/seasonings with meat…some with the veggies and meat in the same bag and some in separate bags. I have found that everything is always extra flavorful and extra juicy! Is the T. in the measurements teaspoon or tablespoon? I somehow just now came across this recipe on Pinterest, and I am so glad I did! It was absolutely declicous! We crushed some plantain chips and added them on top for a little extra cunch… oh soooo good! Thank you for sharing such an amazing recipe! I’m glad you stumbled across this recipe. We love it at our house too. We often grill the chicken and use the vinaigrette as a sauce on the chicken and have smoked veggies on the side. So good! Made this salad for dinner this evening……DELISH!!!!! This was amazing! Trying to get hubby to eat more than meat and potatoes. Any idea how many calories this is? Awesome yeah we try to provide recipes that everyone can enjoy! I say give it a try! I can’t wait to try this recipe. We love Mexican food and with a some with celiac, I always appreciate GF recipes! Thank you! May I ask why no extra virgin olive and use just light olive oil? Light olive oil is light tasting and is better than using a similarly light tasting canola oil. Extra virgin would be far too strong and would totally overpower the flavor of the dressing. This looks fantastic! This is definitely going on my menu soon! THIS looks SO GOOD!!!! I am obsessed with all things chicken, so obviously I am wishing I could stick my hand through the screen and grab some! haha your funny! You should try it and let us know what you think! Perfect timing for me to read this – I need to bring a dish to a dinner and this will be it! Looks perfect, thank you! They turned out so great! Everyone wanted the recipe, and I just forwarded your site! This sounds so good! Since going low carb, I’ve been on the hunt for ways to make basic meals (like a grilled chicken salad) more interesting. Surprisingly, I’ve integrated several paleo recipes, although I’m not at all in search of the paleo lifestyle (not yet, anyway). I’m curious to know if you ever use lime essential oil in your recipes (marinades, dressings, etc) that call for lime juice? Yes, I do. You have to be careful though so you don’t use too much. I also still use limes so I can get the volume from the juice.